This simple but beautiful snowflake bread would not only look stunning as a centerpiece on your table, it also acts as a fantastic sharing dish for all of your family and friends to enjoy. Filled with warming festive spices and served with a sweet chocolate dip, this is definitely a must-bake recipe this Christmas. Bring the milk to the boil and then remove from the heat and stir in the butter until melted. Set aside to cool until luke warm. In a large bowl combine the flour, caster sugar, yeast and salt. Mix to combine. Mix the egg into the cooled wet ingredients and then add this to the dry ingredients. Mix well with a wooden spoon or a stand mixer. Either use the dough hook on a stand mixer and mix until smooth and elastic or knead on a floured surface for 10 minutes. Lightly oil the mixing bowl and place the dough back inside. Cover loosely with a clean tea towel or cling film and set aside to rise for 2 hours or until doubled in size. This may take longer than two hours depending on the warmth of your kitchen and because this dough is enriched and will rise more slowly. When the dough has risen divide into 4 equal portions and roll each into an equal sized circle about 10 inches in diameter. Make the filling by combining the soft butter with the sugar and cinnamon to make a very soft spreadable mixture. Line your baking tray with parchment. Place one circle of dough on this and spread with 1/3 of the filling leaving a 1 cm margin all around the edge. Repeat this process with layers 2 and 3. Finally lay the 4th circle on top and gently seal the edges together. Place a small glass in the centre to use as a guide. Working around, cut the dough into 4 segments. Then divide them in two to make 8. Then divide these in two to make 16 segments. Remove the glass. The next stage works two segments at a time. Lift two segments next to each other and twist them away from each other twice. Pinch the ends together. Repeat this with the remaining pairs of segments. Cover the star of dough with a clean tea towel or cling film and allow to rise for 20 minutes. Preheat the oven to 180°C/160° fan/gas 4. Bake the loaf for 15 minutes and then spoon over any filling that's oozed out. Bake for a further 15 minutes or until cooked through and golden. 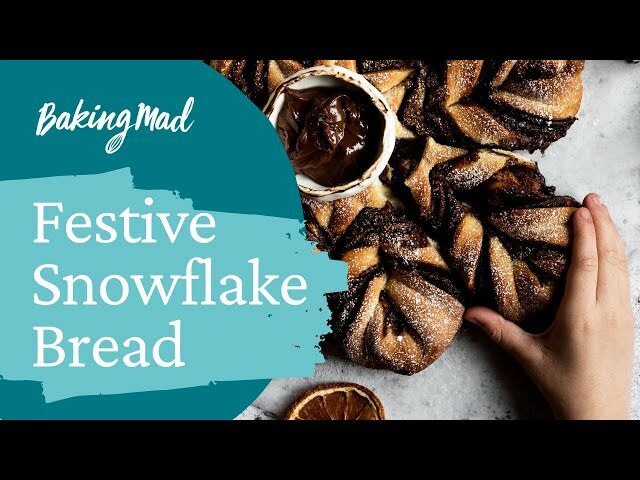 This bread is delicious served warm with a jar of chocolate spread placed in the centre of the Snowflake.